Print this Quiznos coupon and get a nice deal on your next meal there. Buy any regular sub, large sub or large chopped salad and get a regular fountain drink and bag of chips. The deal expires on Jan. 25, 2010. One coupon per person per order, though you can print out multiples and use them on later visits. 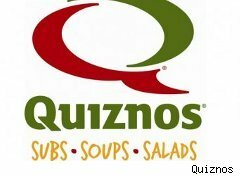 The second Quiznos coupon is for $5 off a delivery order of $25 or more. Caveats: Not valid on delivery orders, custom orders or with any other coupon or offer. Accepted at participating Quiznos locations only. Excludes taxes.